In its recently released SAFER SEAS DIGEST, Lessons Learned from Marine Accident Investigations (2017), the National Transportation Safety Board (NTSB) reports investigating numerous accidents across all modes of transportation where a properly implemented safety management system (SMS) could have prevented injuries, loss of life, or material damage. That document spans analysis of casualties across the full spectrum of all manners of marine craft, blue water and brown, foreign and domestic. An effective SMS has a company safety policy, a risk management program, a safety assurance system, and a safety promotion program. The safety policy is management’s commitment to continually improve safety. A safety culture refers to the attitudes, beliefs, perceptions, and values that employees share in relation to safety. An effective QMS should support and encourage a “safety culture” to address issues of human error and omissions while continually improving compliance with the applicable regulations. A safety management system (SMS) is a structured and documented system enabling both shore side and vessel side personnel to effectively manage safety through a proactive culture of continual improvement. Safety Management Systems (SMS) have been around a long time, and take their most prominent roots from blue water shipping. Eventually – in places like the towboat industry’s newly regulated Subchapter M rules – those procedures and systems found their way into brown water operations. They are here to stay. Some passenger vessel operators have had their own unique SMS up and running for years. PVA’s Flagship SMS, for example, is a voluntary safety management system that is tailored for domestic passenger and small passenger vessels. The PVA Flagship SMS was developed in cooperation with the U.S. Coast Guard, and in December 2016, PVA submitted Flagship SMS to Coast Guard Headquarters for acceptance. On June 12, 2017, the Coast Guard's Director of Inspections and Compliance formally recognized PVA's Flagship SMS as an acceptable method for developing and implementing a company specific voluntary SMS. 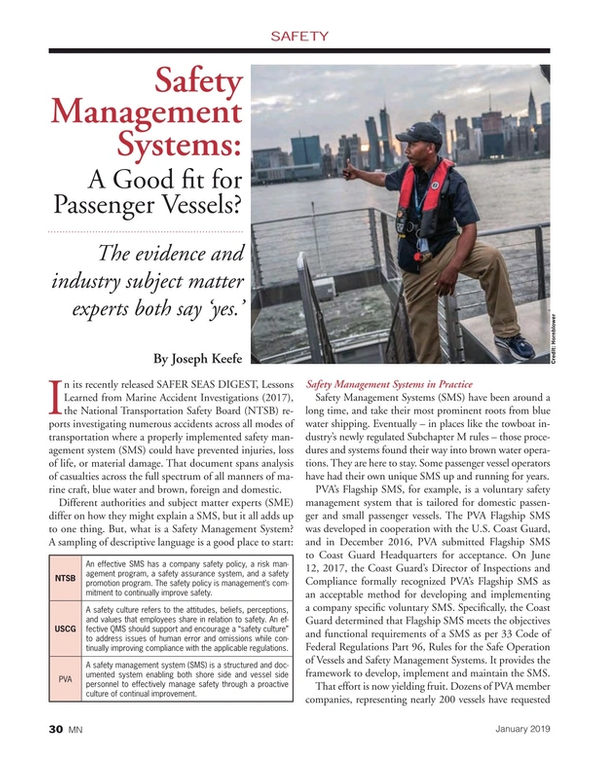 Specifically, the Coast Guard determined that Flagship SMS meets the objectives and functional requirements of a SMS as per 33 Code of Federal Regulations Part 96, Rules for the Safe Operation of Vessels and Safety Management Systems. It provides the framework to develop, implement and maintain the SMS. That effort is now yielding fruit. Dozens of PVA member companies, representing nearly 200 vessels have requested the framework and tools associated with Flagship SMS. Being a voluntary system, members implementing Flagship or its elements do not need to have third party verification. Much like the approved Alternate Security Program, the PVA Flagship SMS incorporates internal audits to determine the effectiveness of implementation. Captain Lee Boone is the Chief of the U.S. Coast Guard’s Office of Investigations & Casualty Analysis. Assigned to U.S. Coast Guard Headquarters from 2008 to 2012, he led the U.S. Coast Guard’s Domestic Vessel Compliance Division, responsible for U.S. Flag marine inspection policy. Boone knows a problem when he sees it, and in most cases, what to do about it, when he does. Notably, explains Paine, each of Hornblower’s operations – from coast to coast – have some differences in their system, related to types of services offered and their fleet, but overall share the same commitment to continual improvement. The SMS has been around a long time. Subchapter M is now heralding the advent of similar changes for the inland towboat sector. And, the passenger vessel sector is cooking up its own version of this emerging safety culture tool. Not everyone is on board with it. USCG Captain Boone thinks that’s about to change, but at the same time, change won’t come easily. Whatever your route to compliance and safe operations, don’t wait until it’s too late to find out you’ve got a safety culture problem.